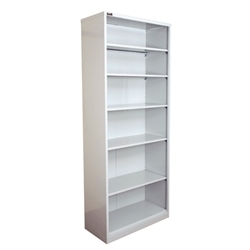 Open shelving unit with 5 x adjustable shelves as standard. Options: Available Assembled or Flat pack for transport. Extra Shelves available. Dimensions: 2200mm High x 910mm Wide x 455mm Deep.